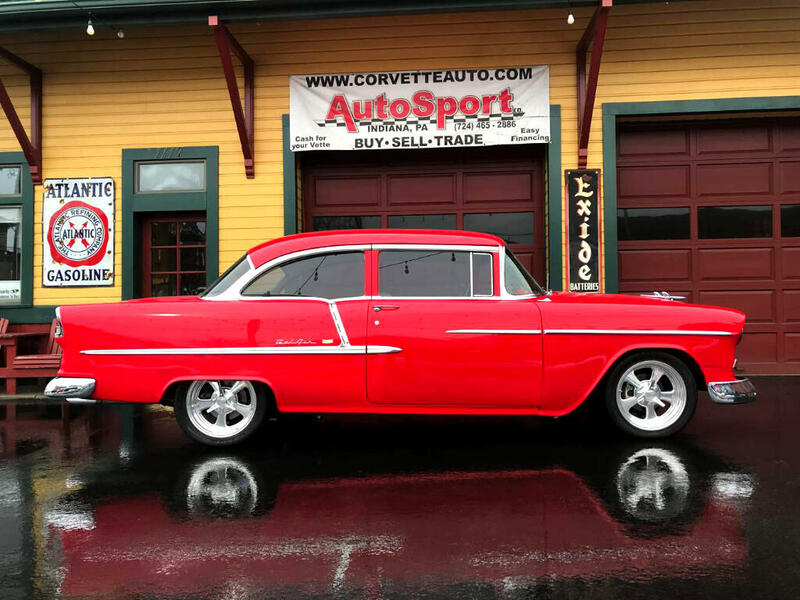 Used 1955 Chevrolet Bel Air Sold in Indiana PA 15701 AutoSport Co.
For sale is a 1955 Chevrolet Bel Air Restro Rod with a 468 Big Block V8! The red paint on this car is in excellent shapet. This car features power brakes all the way around. The engine bay is detailed up with braided lines and features a 468 Big Block V8. The exhaust on this car sounds great and also has cut outs that can be removed. The Vintage AC blows cold and works great. This car also has power steering. The interior of the car has been completely upgraded and customized with new bucket seats and finished in light beige leather. The headliner is also done to. This car has been upgraded and modified with Dakota Digital gauges that look and work great. The stereo has been upgraded with a RetroSound Stereo with AM/FM/AUX cord. The windows are all new dipped and tinted glass. The transmission is a turbo 400 with a 9” rear end. The wheels and many of the other billet items are from Billet Specialties This car runs and drives like a newer car but with the classic appeal of modern technology and big horse power. Financing and Shipping Available! Feel free to call Alex at 724-840-3499 or email us.